Looking for juicy, succulent, sweet-tart taste? You found it. The gorgeous, unforgettable Ruby Red grapefruit is like no other. 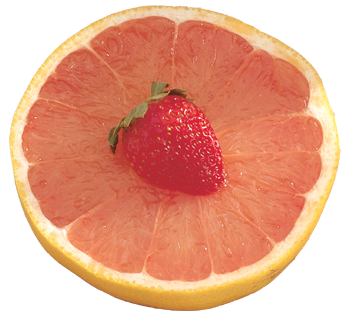 Once the Ruby Red was discovered and hit the market, other grapefruit varieties lost much of their popularity. There’s a reason for that! The Ruby Red has a classic yellow grapefruit peel with a lovely blush of red. Slice open the thin-skinned fruit to find beautiful, light-pink to deep red flesh inside. The Ruby Red is one of the sweetest grapefruits you can buy - without losing that unique, well-loved grapefruit tang. There&apos;s no question that Ruby Reds are juicy! After you&apos;ve enjoyed them for breakfast and sectioned some up for salads, sauces, seafood dishes, or other delights, squeeze up a few and enjoy a glass of the best grapefruit juice you&apos;ve ever had. Can you eat a grapefruit out of hand? When it&apos;s a Ruby Red, you might well want to! This page shows one way to peel the fruit and easily remove the tender, juicy segments. You can buy Ruby Red grapefruit from November through March, but they&apos;re at their peak in January and February. In fact, February is National Grapefruit Month. Did you know that red grapefruits are more nutritious than white ones? It&apos;s true. Like all citrus, grapefruit has plenty of vitamin C — but Ruby Reds are also high in lycopene, an antioxidant with the power to fight free radicals, which age our bodies. In fact, lycopene is what makes red grapefruit red. Ruby Reds are also much higher in vitamin A than white grapefruit. In a scientific experiment, red grapefruit were found to lower cholesterol levels, while white grapefruit had no such effect. The Ruby Red grapefruit is patented! Grapefruit is big in Japan. About 40% of Florida&apos;s grapefruit crop is shipped to that country. Back in 1929, A. E. Henninger of McAllen, TX discovered a red-fruited “limb sport” growing on a pink grapefruit tree. A “limb sport” occurs when one branch of a tree shows different characteristics than the rest of it. Henninger was quick to see the fruit&apos;s potential, and by 1934 he&apos;d patented his discovery. The Ruby Red and other red varieties took off from there.